Apple ended last month on a high by not only updating its line of MacBook Pro computers but also releasing a developer preview of its upcoming operating system, Mac OS X 10.7 Lion, for those with a Mac developer account. I’ve been using the developer preview of Lion on and off since it was released last month, and it has some really great new features, many of which are inspired by iOS and the iPad in particular. Many see this as the first step of iOS and Mac OS X merging together, so is it a successful integration, or are the two operating systems best kept apart? Let’s take a closer look to find out! Those of you familiar with Apple’s iOS devices will have become accustomed to accessing all of the content on your phone or tablet through the wall of apps lining every page of your screen. Many say that Apple could do so much more with the home screen, but you can’t deny that it’s efficient to get to your most valued apps in one tap. The same feature has now been brought over to Mac OS X in Lion, with a hotspot set up – in the bottom left corner of the screen by default – that brings the ‘Launchpad’ to the forefront of the screen, blurring all of the contents behind it. There is also an icon on the dock which takes you straight to the Launchpad, replacing the old dashboard icon. This icon can’t be removed in the developer preview, although I hope that this will change as the operating system edges closer to release; I for one don’t want to have an icon on my dock which I don’t use when I can simply use a hotspot on the screen instead. The folder style used in iOS can also be seen here, with a group of icons sitting inside an expandable folder. When I first saw this, I thought it may look out of place, but it actually looks fairly nice on the Mac. 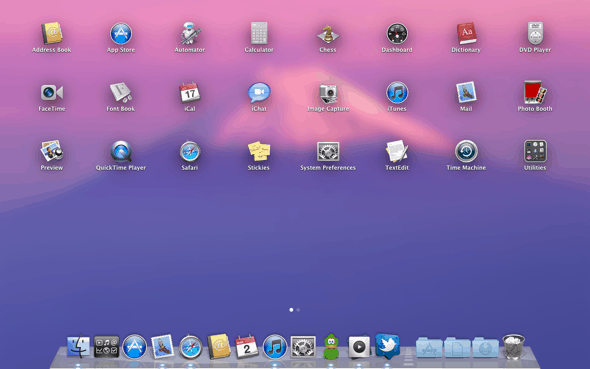 The multi-touch theme to Lion also makes itself known here, as you swipe with two fingers to flip between the various pages of applications which you have installed on your computer. 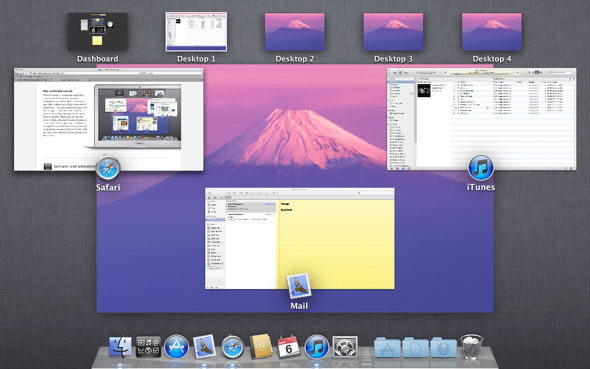 Expose, Spaces and the Dashboard are all features that I use heavily on my Mac. Spaces are crucial to my productivity, as is Expose, and I like to put snippets of information on the Dashboard which I may not always want in full view. Mission Control takes all of these features and combines them into one, easy to access, easy to use space. To access Mission Control, you can simply swipe up using four fingers on the trackpad. The Expose key on the keyboard also works here if you don’t have a multi-touch trackpad. All of your Spaces are organised next to the Dashboard at the top of the screen, with a preview window of the contents of each desktop shown in the middle of your screen, above the dock. When viewing each of the separate windows open on your desktop, or space, every window is now categorised by application, as opposed to a large, free for all mess. Power users with 50 windows open at once don’t need to worry when hitting the Expose key now, your Mac won’t become a scrambled mess of open forms and windows anymore! Even though I only have around half a dozen applications open at once on a typical day, even I’ve seen the benefit that this little tweak provides, and it’s a welcome addition. Mission Control looks great, and the functionality is superb as well. I’ve been able to incorporate Mission Control into my workflow with almost no effort, and it’s really simple to use. I still have reservations over the name, but that’s a different battle for a different day. FileVault first showed up in Mac OS X 10.3, with the ability to encrypt your home folder so that it’s more difficult for potential thieves to steal your data if your computer was lost or stolen (for a more detailed look at Mac security, you can check out our guide to improving Mac security). Since then, the feature has been tweaked but hasn’t seen an overhaul until now. 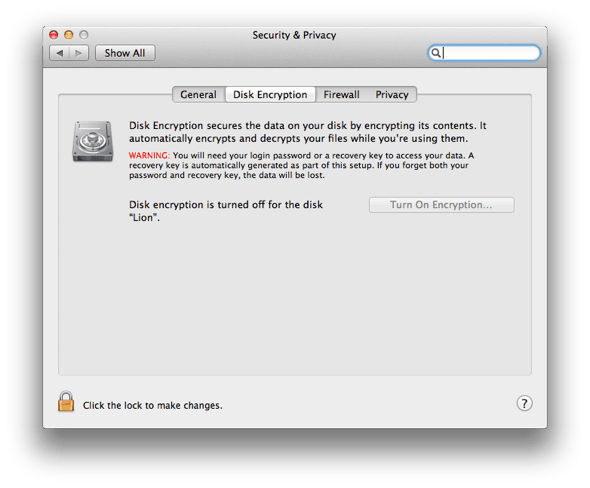 In Mac OS X 10.7, you can now encrypt the entire contents of your hard drive, not just your home folder. That means that all of your application data and other files not in your home folder will be protected if you lose your computer as well. For users with sensitive information on their hard drives, this is a massive step forward, and it’s as easy as clicking a button to become protected. Time Machine is an awesome feature of Mac OS X, allowing you to visually pull files back from a backup, and not panic when you accidentally delete a file or folder. Version control uses the same principle, allowing you to easily recover backups of files, except this new feature does it straight through the app. Each time you save a document, a backup of that document is created with the changes that you have made. That way, you can roll back to any previous versions of a document if you may have accidentally saved one containing incorrect information. 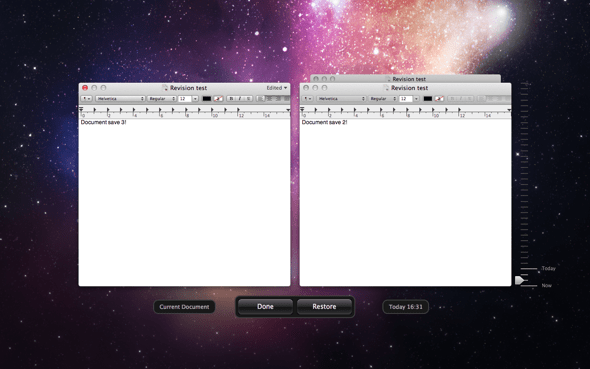 This is a great feature to use side-by-side with Time Machine. If you need to remove some minor additions you made in a recent save, you can simply use version control from within the application. If you accidentally delete the entire document, then you can use Time Machine to pull the whole thing back. Simple! If you’re in the mood for some serious working, the last thing you want to happen is to see your workflow disrupted by an update which requires a restart. If you need to keep things up to date and can’t stand to use a machine without the latest updates installed, this can be a problem if you have work to get through, so Apple has introduced Resume to Mac OS X 10.7. The concept is so simple it’s a wonder we haven’t had it since the days of Windows 98, but most good ideas are like that, aren’t they? When you choose to restart or shut down your computer, all of your windows, and their contents will be saved for the next time you boot up. When your computer comes back on, whether it’s in the next two minutes or the next two weeks, everything will be just as you left it, so you can carry on with whatever work you were doing before the restart. If you prefer to wake up to a clean desktop free of yesterday’s clutter, then you can de-select this option in the shutdown dialogue. From what I can tell, though, it’s re-enabled by default each time, at least in the current, early, version of the new operating system, so make sure you remember to de-select it if you want a fresh start every day. If you’ve ever had to struggle with configuring networks to send files to another computer, you’ll love this one. 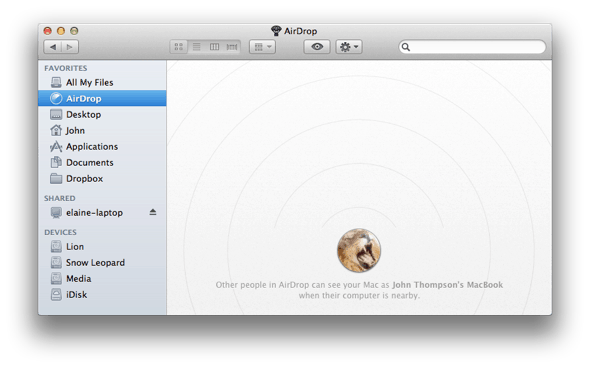 AirDrop in Lion allows you to send files to other Mac users who are running Lion simply by dragging a file on to their computer’s logo in AirDrop. It’s built in to Finder, so there’s no need to worry about running an additional application, and when you drop a file on to another user’s computer, that user is notified and can choose to accept the file. I’ve not had a chance to test this personally yet, although I assume that file transfer speeds will be really fast, as you don’t need to rely on a network to send files over, everything is sent directly between the two computers via AirPort. This feature may also stay activated even when Wi-Fi is switched off as well, because the option to ‘Turn off AirPort’ now says ‘Turn off Wi-Fi’, at least on my machine. Mail is the default e-mail client which ships with Mac OS X. Mail 5 has some pretty cool features, integrating features such as conversation view into the client that before now were difficult to find in a free client, although more expensive clients such as Postbox integrates a conversation view as well. 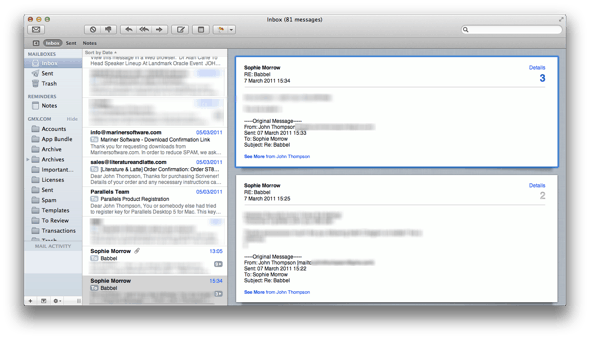 The conversation view in Mail 5 works as you’d expect. If you select a thread of messages in your inbox, you will be able to see all of the replies that you have received in the conversation. Your responses are hidden, although you can view them if you so choose. The buttons are in keeping with the general theme of Lion as a whole, with a more modular look compared to the buttons in Snow Leopard, or previous versions of Mac OS X. Like other built-in applications in Lion, there’s also the option to go to a full screen, iOS-like view. If you spend a lot of time sorting through emails, this may be worth utilising. Mission Control also dedicates an extra “desktop” for each full-screen application that you use, so that you can still access other applications in your desktops without leaving full-screen view on the application which you’re currently viewing. This may be more insignificant than many of the other changes present in Mac OS X 10.7, but the update to Address Book shows that Apple is really keen to integrate as much of iOS into Mac OS X as possible, even down to the finer details. 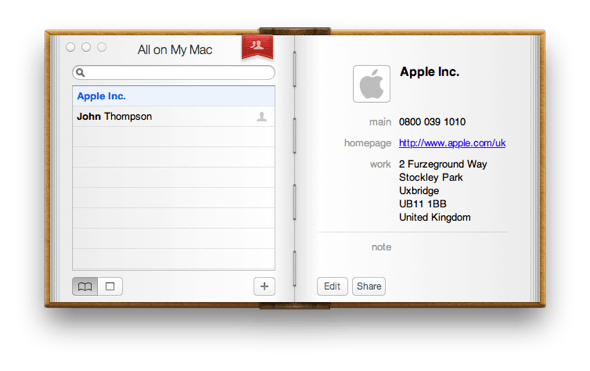 The theme of the address book has been given an overhaul and is now almost identical looking to the application on the iPad. A list of your contacts is displayed down the left-hand side of the window, with contact information on the right-hand side of the window. It’s simple, looks good and works. You can’t really ask for much more from an address book than that. 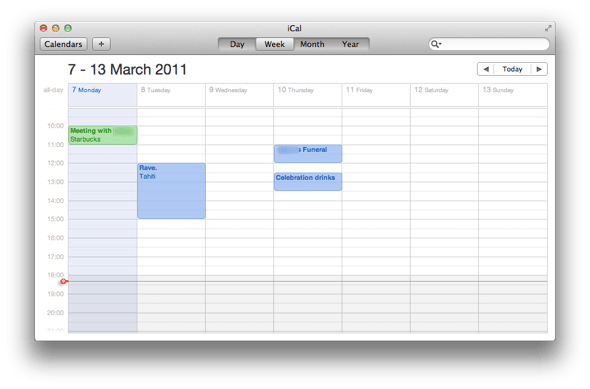 Mail may have gained a few features in the transition to life in the Lion, but the focus of the latest iCal update is undoubtedly that of simplicity. 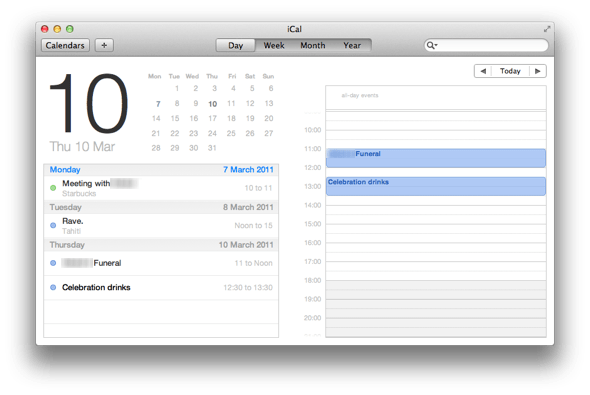 Again, it seems to have gained many traits of the iPad application, with details such as the pop-up calendar menu finding its way on to the Mac. Overall, it works well. There are four view options at the top of the page allowing you to switch between daily, weekly, monthly or yearly views, and everything is very minimalist. There is, of course, a full-screen view included in the application too, which does what it says on the tin and makes the window full screen. iChat has also received a minor update in the transition to the new operating system and includes a few neat features which have made me abandon Adium, at least for the time being. The conversation window now includes two sections, the left of which contains the conversations which you have open, whilst the right-hand side shows the current thread. When you receive a new message, you can also see a short preview of the message underneath the contact’s name. 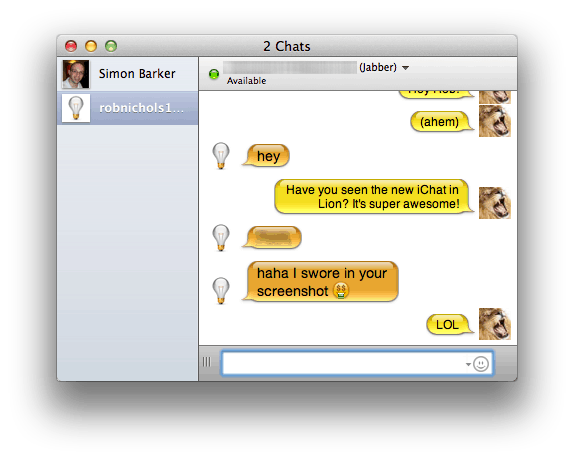 Like the recent versions of iChat in Snow Leopard, you can connect to popular IM services, such as Google’s GTalk, out of the box. This is thanks to extended Jabber support, allowing for various protocols to be enabled out of the box. Even if you don’t see a protocol listed, there’s a good chance you will be able to manually add it so that you can use iChat instead of third-party alternatives. There’s no ambiguity in where Apple is heading with Mac OS. Recent successes of iOS have Cupertino taking a closer look at what can be done to simplify their desktop operating system as it matures with each release. Many of the features in Lion are welcome additions, and I personally like the direction in which Apple is heading. If we begin to see more touch-centric hardware appearing on Apple’s mobile computers, many of the new software features in Mac OS X 10.7 Lion will certainly come into their own and vastly improve the user experience and learning curve, with many people familiar with the iPhone and iPad already. If you’re a Mac user, are you looking forward to getting your hands on Lion in the coming months, or will you be staying on an older version for the near future? Make your opinions known in the comments, we’d love to hear from you! Mac OS X Lion & Its Best New Features – Lion In The Spotlight!